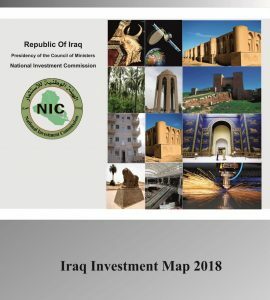 Dr. Sami R. Al Araji, Chairman of the National Investment Commission, confirmed the importance of unifying economic goals and visions regarding several investment activities in Iraq by focusing on lost opportunities and required treatment using effective and brave decisions by relevant economic agencies in the country. During the Investment and reconstruction Conference in Dyiala Province, organized by NIC sponsored by the Parliament Investment and Economy Committee, Wednesday 16/8/2017, he presented a number of various obstacles such as unimplemented items in investment law no. 13 for 2006 (amended) like activating the One Stop Shop, solving the lands issues, and banks and financial services in addition to allowing PICs to enjoy more immunity and independence, hiring the right people for the task according to investment law and regulations. Mr. Burhan Al Mimary, Parliament Member representing investment and economy committee, mentioned in his speech that Dyiala Province is, more than any other time, ready to develop and we all should invest available actual opportunities including human potentials, promising opportunities and open market. He also focused on the government support for this aspect. 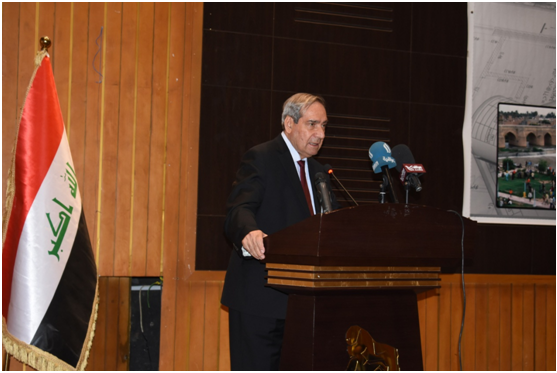 Mr. Muthana Al Timimy, Diyala Governor, assured investors wishing to invest in the province a stable and secure statues after being attacked by ISIS. Now, Diyala is safe and unified against ISIS due to its ancient tribal variety. He added that the investment map allowed everyone to know about available resources. Mr. Mohamed Jawad Al Hamdani, representing Chairman of Dyiala Province Council, reviewed a number of available investment opportunities in different sectors (oil and gas, health, housing, infrastructure, agriculture and industry). He added that the province council is a great support to any investment project that might be of any benefit to Diyala people who suffered for a long time from lack of services. 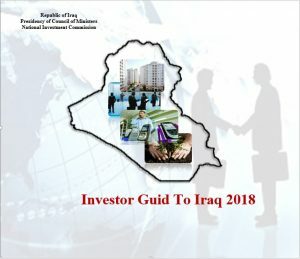 The province geographic location is a strong attracting factor for investors due to land roads linking Baghdad to neighboring countries. The conference witnessed a detailed presentation of available investment opportunities by Dr. Sami R. Al Araji, Chairman of the National Investment Commission, Mr. Mijwel Mehdi, Chairman of the Dyiala Investment Commission, Mr. Raad Almas, Parliament Member representing Dyiala, Chairman of the Iraqi Industry Union, General Secretary of Chambers of Commerce, a member of Businessmen Association, and Chairman of the Iraqi National Business Council. 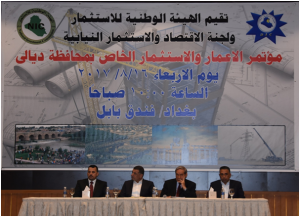 The conference was attended the Head of Parliament Investment and Economy Committee, a number of Iraqi Parliament members, in addition to Vise Ministers and DGs of Industry, Agriculture, Electricity, Housing, Municipalities) ministries and a number of businessmen and investors.